Keys to Personalized Marketing on Dealer Websites - Cox Automotive Inc. Dealership Website Personalization goes beyond a simple, customized greeting or offer. The most effective personalization will present the most relevant inventory, specials, and incentives to each unique shopper, and carry that experience past the homepage and deeper into the site driving more engagement and increasing the chances they will walk into your physical showroom. Personalization can lead to profitability. An analysis of 88 rooftops by Dealer.com showed significant increases in click-through rates to vehicle details pages as well as a bump in form and phone leads when personalization was implemented. Personalization is a powerful tool emerging in the automotive space. Soon, dealers can expect to use customer search and browsing data to form a deeper understanding of every customer who visits their site, and to integrate this data into their digital marketing strategy. Anyone who has browsed the “recommended for you” section of Amazon knows that curated shopping experiences provide convenience and enable shoppers to find relevant merchandise faster, which is key to building brand loyalty. In the automotive space, the prevalence of online vehicle research, as well as the resulting increase in available consumer shopping data, has made it possible for dealers to bring new levels of customization and automation to their digital marketing strategies, with exciting results. 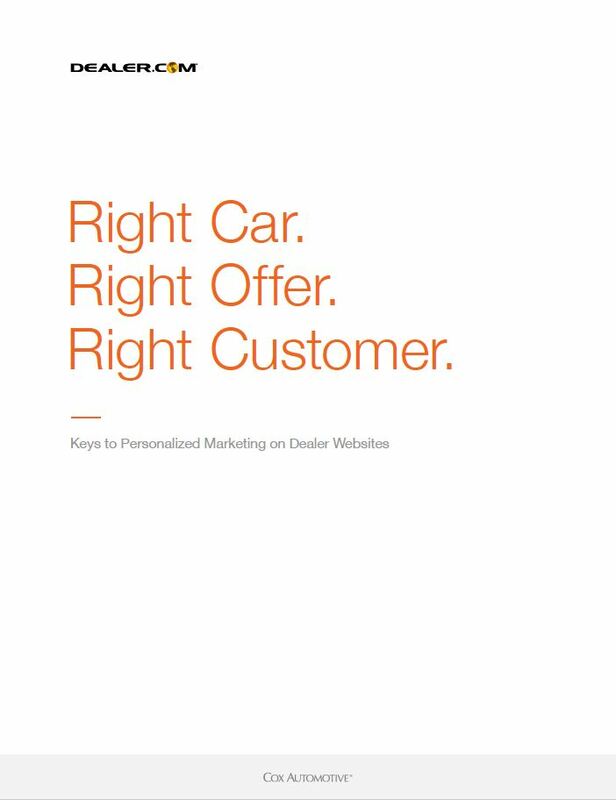 The following white paper examines key facets of personalization within automotive eCommerce and its impact on consumer behavior and dealer website performance. Data was gathered from Dealer.com’s industry-leading network of dealership websites. Download to discover how to put the right car and the right offer in front of the right shopper with personalization.